...helps to unload sandpaper discs & sand into workpiece corners that would otherwise be difficult to sand without this feature. ...from the drill press function lets you move the disc to the workpiece for improved control & repeatability. ...far surpasses that of any other disc sander available today. Twin miter gauge slots & versatile rip fence help you control workpiece with improved precision & repeatability. Rigid & floating extension tables make handling large or long boards a breeze. Click Here to learn more about how Shopsmith's shared features will improve your precision & save your time. The Shopsmith Disc Sander is truly in a class by itself. No other disc sander (including big money commercial units) offers the extensive assortment of work-saving features and benefits provided by the Shopsmith. Its Huge 17" x 22" Worktable... eclipses those of even the largest available commercial machines and tilts up to 45° for beveling or chamfering. And, by adding your included extension tables, you can create huge, supportive surfaces for handling super-long and / or wide workpieces with ease. 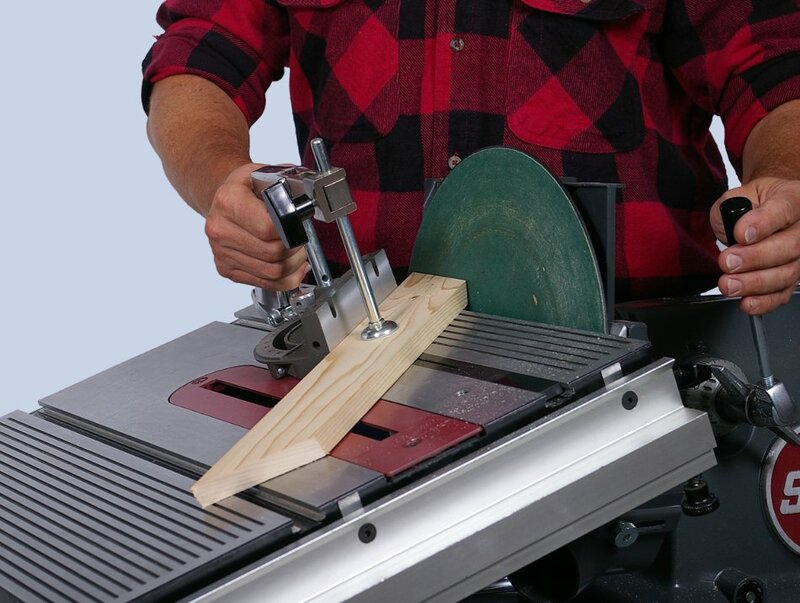 The dual T-shaped slots in the worktable surface let you use your Shopsmith miter gauge to create fixtures or stops for controlling workpieces ... or hold those workpieces firmly while you sand straight or angled edge or end grains. You can even attach the Shopsmith rip fence to the table surface and use it as a guide or stop for improved workpiece control. The Right Speed for the Job... Unlike other disc sanders, Shopsmith offers you an infinitely variable (250 to 10,000 RPM) speed range that lets you control the aggressiveness of your abrasives for hard or soft woods -- rough or finish sanding -- all at the press of a keypad. Move the Disc to the Workpiece... Where the discs on other sanders remain stationary, requiring you to move the workpiece into the disc... with Shopsmith's quill feed feature, you can actually move the Disc up to 4-1/4" toward or away from your stationary workpiece. This unique feature allows you to make quick, easy micro-adjustments when sanding single or multiple components to a precise, identical dimension. Effective Dust Collection... is provided by Shopsmith's lower saw guard. Just attach the optional Shopsmith DC-3300 Dust Collector or any shop vacuum to its port to whisk away most of the sawdust you create before it becomes an airborne shop hazard. 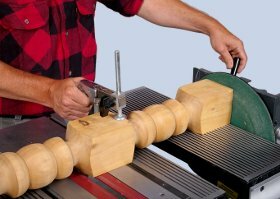 Optional Lathe Chisel Sharpening Guide... lets you use your disc sander to produce precisely angled, razor sharp edges on your lathe or bench chisels. Premium Quality Pressure Sensitive Sandpaper Discs... are available in a variety of grits for rough or finish sanding -- as are special Quick-Change Discs featuring a time-saving hook-and-loop fastening system that lets you switch from grit to grit in a matter of seconds. Our Exclusive Optional Conical Disc Sanding System... is only available from Shopsmith. Its conical shaped steel disc and special sandpaper discs allow you to sand (or joint) super-smooth, swirl-free edges or surfaces up to 4" wide. This is especially handy when working with highly figured woods that have a tendency to chip when run across a jointer. This unique disc can also be used (in conjunction with a special Shopsmith Sharpening Guide) to hone the edges of your Shopsmith Jointer or Planer Knives.